This is the first in a series of features about our member organisations around Aotearoa New Zealand. Nam Kook temple is a supporting organisation of the New Zealand Buddhist Council. In the past, the Buddhist Council has assisted the temple by writing a supporting letter for Ven. Dong Jin’s application for Permanent Residency. This temple has around a hundred householder members, Korean Buddhists living in the Auckland region. It’s connected with a temple in Korea called Ankook Suwon. Buddha’s birthday is a colourful festival, celebrated in May each year, and it’s a great time to visit Nam Kook temple in rural west Auckland. The event is partly a cultural festival: there’s much to enjoy, from performances of music, drumming and dancing, to family activities including face-painting and lantern-making. It’s a religious festival, with a sermon, chanting, and a ceremony of bathing the Baby Buddha, in a Buddha Hall bedecked with hundreds of colourful paper lanterns. And then there’s a feast with tables laden with Korean temple food — an array of tasty and beautifully-presented vegetarian delights. People from the wider community attend, including local neighbours. 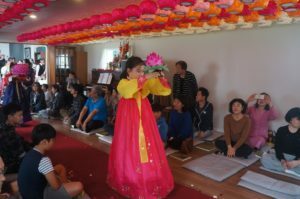 A music concert is held, and performances have been given by the local Kumeu Brass Band, members of the Hare Krishna Temple across the road from Nam Kook, a Korean Traditional Dance Team, Korean Catholic Church families, and much more. Nam Kook’s members plan to build a larger prayer hall, as their present one is too small. Longer term, they hope to build a temple complex with a layout like the traditional temples found in Korea. 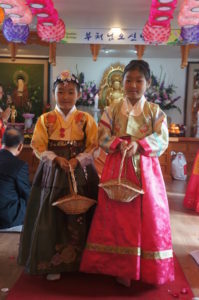 Nam Kook’s membership faces challenges that will be familiar to many immigrant communities: the first generation feels a strong attachment to the temple as a community focal point where they can speak their own language and eat familiar food, as well as engaging in the traditional religious activities. Their children, however, often have different interests. The temple’s trustees are always looking for ways to pass on the benefits of their tradition while being flexible enough to stay relevant to the next generation. A few years ago they ran a summer camp (Temple Stay) and had good feedback about that, and they intend to run a similar event in the coming year. The kinds of challenges the temple’s leaders face will be familiar to others involved in running a Buddhist temple or centre. The community is often short of volunteer power, including people with the skills to teach children, teenagers, and young adults; and they need more funds to carry out their projects. Another challenge for Korean Buddhists is that the majority of Koreans in New Zealand who are religious are Christian. The percentage who consider themselves Buddhist is relatively small, so they are a minority within a minority. But the Nam Kook community has found some creative ways to engage the Korean community and to draw New Zealanders to their events too, including a “Pray on the Beach” event. They even organised a golf tournament for the Dharma Cup as a way of strengthening ties with the wider Auckland Korean community. Says Nam Kook Temple’s committee member, Yong Jun Kim, “We wish that more New Zealanders would become aware of Buddhist Teachings and the Dharma, and that they know how to use the techniques to make them happy. We would like to play a role to connect New Zealand culture to Buddhism to create a happier life for all.” Yong Jun Kim has recently joined the Buddhist Council executive committee, and so is now working with us to this end. 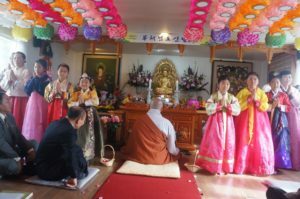 Photos show the Buddha’s Birthday in 2017 in Gwan Um Jeon (Avalokiteshvara hall) at Namkook temple, Kumeu, Auckland. To find out more about how you and / or your organisation can be involved in the Buddhist Council, please contact us.